Looking towards the North end with the boatsheds just visible and Mt. Cooper in the background. When we were growing up in the 50's, we remembered the few shops that were at the bottom of our street on Bay Drive. There was Jack Taylor's Four Square store - where we used to put our groceries and lollies on tick - in his little book, and then pay for them at the end of the week. They had a large variety of lollies. Some lovely gob-stoppers and chocolate roughs and many more. No wonder our food bill used to get a bit high. I remember once when I was little, charging up quite a number of different lollies - and then presenting them to mum as a birthday present. I wonder why I didn't realise that Dad had to pay the bill - and they weren't free. We were very lucky then, to have home deliverys after we had rung up - or taken our written orders into the shop. They were delivered right inside our doors - even when we were out. We had a wonderful time looking for any special 'goodies' that mum might have ordered. It was usually bars of chocolate each - all different, so we had the usual squabble as to who got what. There was also a small Post Office, Les Ayson's Chemist shop, Hazlewood's butcher shop, a bookshop and a fruit shop. And not forgeting the wonderful cake shop Rickard's. This photograph was taken from Rocky Bay. Mana Island is on the right side and the sun is setting over the South Island in the distance. The 'crocodile' rock formation. 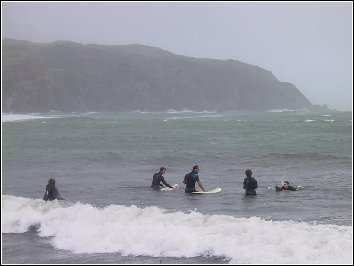 Surfers at Titahi Bay Beach. We had a wonderful view of Rocky Bay from our sitting-room window. Some parts of the rocks had very vivid formations. One of them especially, looked like a crocodile, lying down with it's snout in the water sleeping. Whenever we went out for walks, we used to say to our mother - 'We'll be down by the crocodile'. That name stuck for all the years, and now our children still call it that. 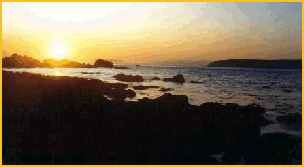 Titahi Bay is a fabulous place for surfing and the beach has been a focal point of settlement. 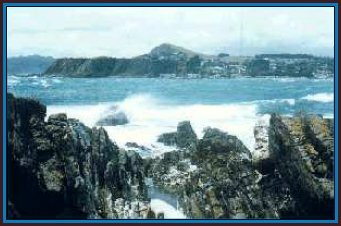 It was a food gathering place for the early Maori as early as the 15th century when there were Maori villages along the coastline, and then by the mid 1800's there were European whaling stations and villages. William Jillett was 21 when he bought some land in 1887 and established a resort for wealthy Wellintonians and the development of the Bay as a holiday place continued until World War 2. 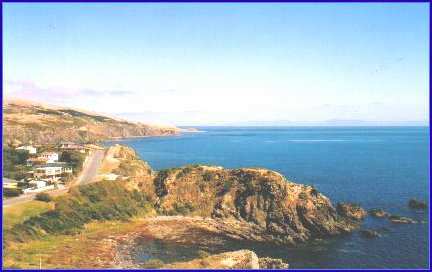 It is a spectacular setting for the beach, peninsular, cliffs, rocks, Mana Island, harbour and the sea. The first boatsheds were built around 1918 at the northern end of the beach and soon after that other boatsheds and bathing sheds were built. In 1948, there were 30 boatsheds licensed - in two clusters. They are now icons of Titahi Bay beach, as they are all privately owned. Before the war Titahi Bay was probably the most popular beach for picnics and swimming. On a lovely weekend the beach would be lined with cars sometimes three rows from one end of the beach to the other. Another view of the Beach, looking towards the North end. The mast of the radio transmitter 2YA can just be seen to the right of Mt Cooper. This 700 foot mast was declared open by the Prime Minister, Michael Savage, on 25 January 1937. 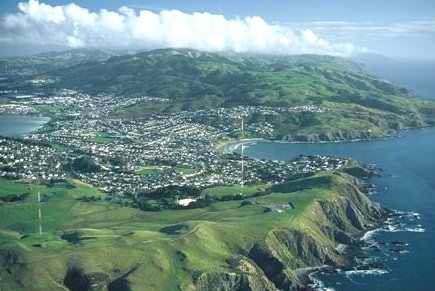 This view is taken from the air at the back of Mount Cooper and shows the 2 wireless masts in the foreground, Titahi Bay Beach on the right and Porirua Harbour on the left. 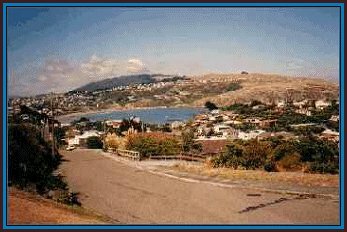 Please email me for information about Titahi Bay.